Most people tend to associate drones with hobbyists, delivery services, or the military. But UAVs have applications beyond these areas - such as rescue operations. That’s the aim of Project Hero, a version of Land Rover’s Discovery SUV featuring a quadcopter drone that can take off and land from the top of the vehicle, even when it’s in motion. 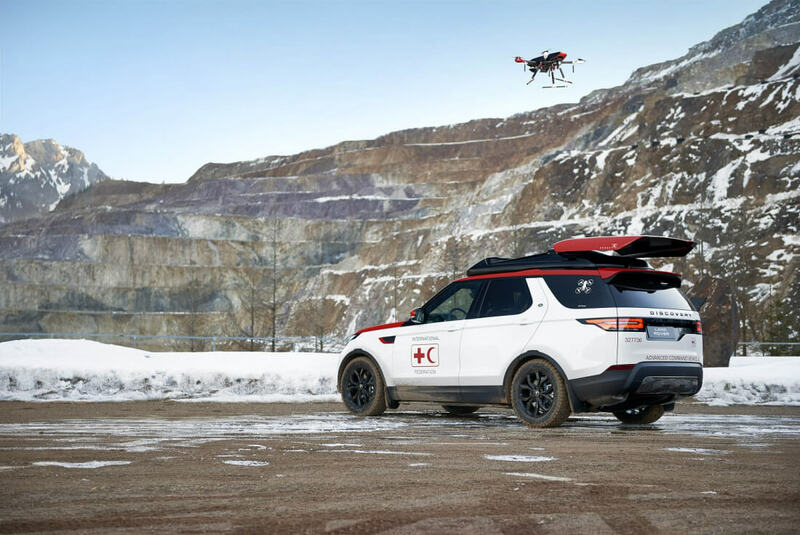 Jaguar Land Rover Special Vehicle Operations (SVO) has created this amazing version of the Discovery for the Austrian Red Cross. It will be trialed by the organization's emergency response team in the hope it can save lives during disasters by speeding up response times. The SUV itself is based on the 3.0-litre TD6 engine-powered version of the new Land Rover Discovery. Extra features (other than the drone) include a heavy-duty sliding floor in the rear, specialist communications equipment, and extra LED lighting to aid night driving. As for that quadcopter, the company says it can land on the speeding vehicle thanks to the world’s first self-centering and magnetic retention drone technology. When in the air, the UAV can send live video footage to emergency response teams, giving them a birds-eye view of areas hit by natural disasters like earthquakes and floods, and allowing the surveying of a scene from a safe distance. The drone can be controlled from the safety of the vehicle using a tablet app that allows the occupants to assess the surrounding environment as they drive. Other automakers are looking at integrating drones into their vehicles, especially for the purposes of delivering goods. If Project Hero proves successful, don’t be surprised if drone-carrying SUVs become a common sight at disaster areas.